JOIN US IN HOUSTON FOR NCTE 2018! Words matter. Our students’ voices matter. Learn strategies for using literature as a way into difficult—and essential—classroom conversations about race, identity, and community. Practice working with Shakespeare and contemporary texts, using resources created and tested by the Folger and excellent classroom teachers. ALL kinds of students connect with not only Shakespeare but ALL complex tests, since ALL students are deserving and capable of understanding rich language and great stories. Learn and practice this revolutionary methodology that makes literature fans of all kinds. Observe in real time: teaching, learning, and the voices of student response. Shakespeare-unlimited Houston high school students make his language their own with a play they’ve never read, through the Folger’s core activity, 3-Dimensional Shakespeare. This is the way into a play, or any complex text. What happens when the Folger and DC Public Schools pair up to improve Shakespeare instruction? A new curriculum! New PD! Student voice a priority! Assessment and writing! Join us for a practical glimpse into the curriculum that is changing how DCPS teachers teach Shakespeare as well as other complex texts. Stop by the Folger booth for all things Folger - teaching ideas, digital resources, professional development options, and tons of fun! Missed any of our sessions on Friday? Don't worry: there's still plenty of time to visit the Folger booth for all things Folger! 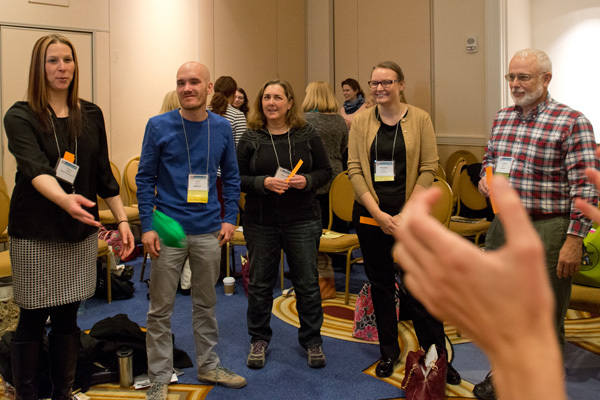 We host a flash mob every year at NCTE--a beloved English teacher tradition! This year, join us for the world's largest funeral scene! Join a chorus of Antonys (or Plebeians) and shout for all of NCTE to hear. As a bonus, and thanks to our friends at Simon & Schuster, we will give away Folger Editions of Julius Caesar to the first 100 participants. Sparks fly when students read the plays of August Wilson and William Shakespeare alongside one another. Learn WHY and HOW to connect these two authors in a way that deepens students’ attention to language, identity, and power. Their voices and your teaching benefit! Stop by the Folger booth for your last chance to check out everything Folger!